Core inflation, which removes the most volatile components of CPI (food and energy prices), also rose 0.2%. This was in line with expectations. The stated goal of The Federal Reserve is to keep CPI at 2.0%. However, the market did not have as strong reaction to the number. The securities which should be the most heavily impacted by the release of CPI number are TIPS (Treasury Inflation Protected Securities). The principal value of a TIPS is directly linked with CPI. If CPI goes up 2.0%, so will the principal value of the TIPS bonds. The 10 year TIPS barely moved with its price decreasing 1/16 of point. In another words, nobody was shocked by the numbers or thought it would have an impact on the FED’s interest rate policy. 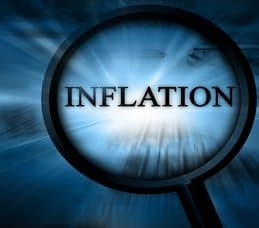 The inflation number is however bad news for those living on limited income from investments, given where interest rates currently stand. A typical 1 year CD pays around 0.76% APY. An investor in CD’s would in fact be losing money in terms of their ability to purchase goods and services. After a year, $10,000 invested in a 1 year CD would be worth $10,076. However, to buy the same amount of “stuff” that $10,000 bought a year ago, an investor would need $10,290. In short, the “Real Interest Rate” (interest minus inflation), is negative. This is very abnormal. Typically, the real interest rate is between 1 and 2%. (See Table Below showing historical real interest rates). This abnormal situation may last until the end of 2014. The Federal Reserve has been actively keeping interest rates low in order to spur economic growth and reduce unemployment. In the most recent meeting, the consensus view among FOMC members (the decision makers) was that their low interest rate policy would continue for the next two years.